The Photo below was taken in 1996 on a visit to the shed used by the hastings diesels group. It shows (from right to left) 'Zebedee' 83 301 the class 33 used for Eurostar bogie trials (since cut up), The hastings line buffet car RDB 975386 used as a test coach for the APT, and just visible is an ex LNER CCT van. In order to give background information I have scanned information below from one of their information leaflets. NOTE - I HAVE NO CONECTION WITH THIS ORGANISATION this information is provided for interest only. St. Leonards was first reached by the London, Brighton and. South Coast Railway, via Lewes, in 1846 and then the South Eastern Railways line from Ashford via Rye and Hastings joined it in 1851. The more direct Tunbridge Wells to Hastings line opened in 1852 and was built as economically as possible by the South Eastern Railway. One consequence was poor supervision of the company's contractors who built the tunnels without sufficient lining and, soon after opening, strengthening became necessary by adding layers of brickwork - thus making the tunnels narrow, for which the line became famous - or rather infamous! This legacy, over the 100 years prior to their introduction, gave rise to the narrow 'Hastings Diesel' units which were built at Eastleigh and were progressively introduced from January 1957 until June 1958 to replace steam on the London Charing Cross to Hastings route via Tunbridge Wells and Battle. Unique to British Railways, all 'Hastings' stock was constructed using a modified MK1 coach design with 8ft wide flat sided bodies (9ft over the stepboards) and an initially short coach length of 58ft. The narrow dimensions gave them a designation of Restriction 'O' - in theory they could go anywhere! The later builds of the class incorporated a longer coach body of 64ft 6ins and seven units also boasted a buffet car; all 23 units being powered by two 500hp English Electric diesel engines driving motors on the power bogies. 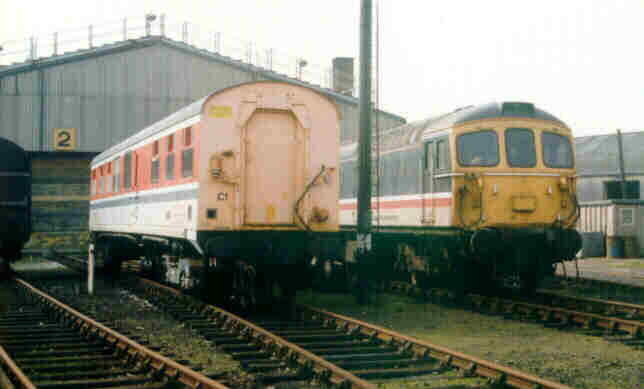 A policy decision meant that all buffet cars were withdrawn in 1980 and these units converted to a 5-car formation. Years of sterling service took their toll on the trains, despite the loving attention given to them by the maintenance staff at St. Leonard's Depot when, in October 1983, electrification of the route and the singling of the track through the narrow tunnels was announced. Standard dimension trains would then be able to use the line. Various farewell rail tours were organised, one of which ran over the Settle and Carlisle and West Coast routes to Carlisle! However, 11th May 1986 was the 'Hastings' units' last day in mainline revenue earning service, as electrics took over full operation of the Hastings route the day after. A few hybrid units and coaches lingered after this date and, fortunately, the volunteers of Hastings Diesels Limited have ensured that some of these unique trains have survived for you to enjoy now and in the future. The Hastings Diesel Group was founded in 1986 and in June 1987 the Group was reformed to become Hastings Diesels Ltd, a private company, with shareholders. Since its formation, the Group/Company has acquired a total of 15 Hastings diesel vehicles comprising 5 driving power cars, 6 second open, 3 first class and one buffet car. All are based at the ex-BR, St. Leonards Maintenance Depot - their original home. Hastings Diesels Limited is managed by elected directors and a company secretary, all volunteers, and uses the skill, financial support, and enthusiasm of its members to undertake restoration work. The Company has a share capital of £50,000 and the Shares are divided into two categories. The 'A' Shares are the voting shares: any shareholder is permitted to hold, and must hold, a single 'A' Share valued at £1. 'B' Shares are the asset Shares and are nominally valued at £100. A shareholder may hold number of' �B' shares. The principle is 'One person, one vote'. In 1990, the directors of HDL formed a parallel, but totally separate company, St. Leonards Railway Engineering Ltd. This now holds the tenancy of St. Leonards West Marina Depot, near Hastings. HDL rents the space in the depot from SLPEL. Initial shares in the company may be purchased outright by one payment or over a period of tiriic by Banker's standing, order of at least £5 per month. All shareholders receive occasional newsletters, a discount on Company sale items and of course, are invited to the annual AGM which is normally linked to an interesting event, using our own stock. Shareholders are always welcome at St, Leonards to help restore their vehicles.